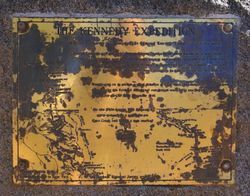 A plaque commemorates the ill-fated expedition of Edmund Kennedy in 1848. In 1848 the Assistant-Surveyor of New South Wales, Edmund Kennedy, led an expedition to explore Cape York Peninsula. Arriving at Rockingham Bay (north of Townsville) in May, Kennedy`s party, after much privation and toil, reached Weymouth Bay, where they established a depot. Kennedy, with four others, Costigan, Dunn, Luff, and an aboriginal, Jacky Jacky, left this depot in an endeavour to reach Cape York, where a relief ship was expected. Kennedy and Jacky Jacky continued north, after leaving the others at Shelburne Bay. 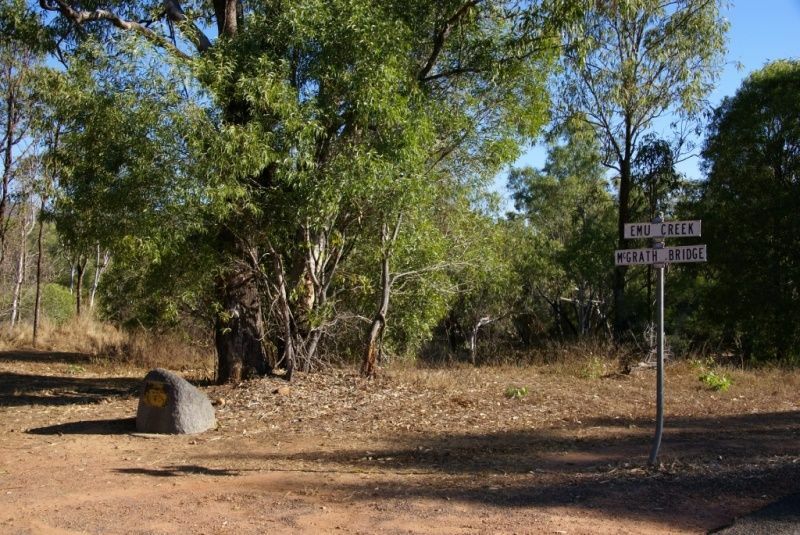 Only Jacky Jacky reached Cape York, for in a skirmish with blacks Kennedy was killed. Jacky Jacky guided the ship`s relief party to Shelburne Bay, but Costigan, Dunn, and Luff had perished. At the Weymouth Bay depot, only two survivors were found. This plaque was erected to commemorate the passage of the Edmund Kennedy Expedition past this point. Edmund Kennedy and party with horses driving one hundred sheep started from near Cardwell. After struggling for several weeks through swamps and tropical rainforest they found a way up and over the deep coastal range to more accessible terrain. They travelling (sic) west then north down Emu Creek which they followed to its junction with the Walsh River. Continuing on to within a short distance of Cape York, Kennedy was fatally speared. Jacky Jacky his faithful Aboriginal companion eventually reached their planned destination on the 23rd December 1848.